HandKrafted by Stephanie: Sparkle Creations March Release: Mr. and Mrs.
Sparkle Creations March Release: Mr. and Mrs.
Hello and Welcome to Day 3 (the final day) of previews for the March release for Sparkle Creations Rubber Stamps! Sparkle is releasing 2 new SCRS images and 1 new Karber clear set, and they are available in the store now! 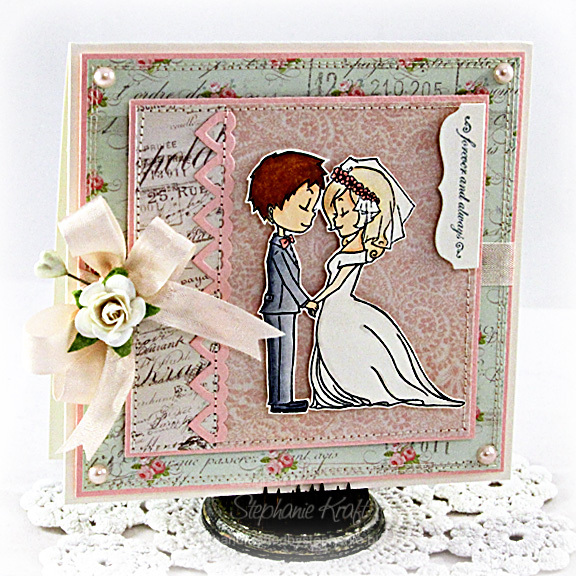 Today we are previewing the final SCRS image, Mr. and Mrs. and sentiment, "forever and always"! I stamped, colored and cut out this sweet image of Josh and Emily. Then I popped them onto my layout. I used coordinating patterns from the Pink Paislee London Market collection (♥ it!). Be sure to visit all rest of the SCRS designers for more peeks of Mr. and Mrs. Sparkle will be giving away a Mr. and Mrs. to one lucky person! For a chance to win, you need to comment on all of the designer's blogs (list below). Then head on over to the and comment on the Mr. and Mrs. post. You have until midnight EST each day to comment. The lucky winner will be announced the following day! Accessories: Die-namics Mini Tabs Foursome (MFT), Heart Border Die (Taylored Expressions), Markers (Copic), Seam binding, Rose (Prima), Pearls (Basic Grey), Heart stick pin (Maya Road), Foam tape, Thread, Sewing machine. Gorgeous card!! I think I need that image - love it!! OHHH! I love that tab for the sentiment--and ILOVE your papers! I love that heart border too! FAB coloring:) YOU ROCK! such a beautiful design. gorgeous card, Steph! hope you have a lovely card! This is so sweet!! I love this little couple. Lovely papers and a sweet image on your card. Beautiful!